At Samsung’s Tab Into Color event, Samsung announced its latest Galaxy Tab S Android tablet series. The series contains two models at present, including 8.4-inch and 10.5-inch. If you’re curious, let’s go on checking. 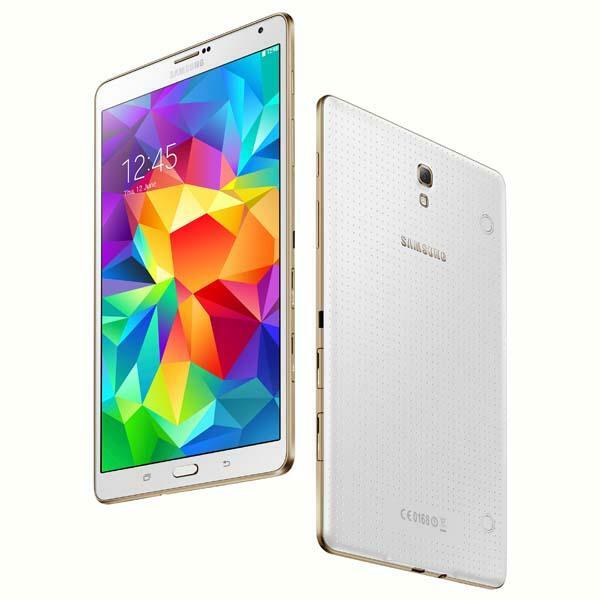 Samsung Galaxy Tab S 8.4-inch measures 125.6 x 212.8 x 6.6mm, weights 294g (WiFi) /298g (LTE), and as its name implies, the Android tablet sports a 8.4-inch Super AMOLED display with 2560 x 1600 pixels resolution, while 10.5-inch model comes with a 10.5-inch Super AMOLED display with 2560 x 1600 pixels resolution. Moreover, both 8.4-inch and 10.5-inch models feature Exynos 5 Octa (1.9GHz quad-core processor and 1.3GHz quad-core processor) or Qualcomm Snapdragon 800 2.3GHz quad-core processor, 3GB RAM, 16/32GB internal storage, 2.1-megapixel front-facing webcam, 8-megapixel rear camera with LED flash, and integrated fingerprint sensor. Other specs also include WiFi, Bluetooth 4.0, GPS, GLONASS, microSD card slot for up to 128GB, and 7900mAh /4900mAh rechargeable battery. Apart from that, both Android tablets run Google Android 4.4 KitKat OS, and their Sidesync feature will let you make or answer calls via the tablet if your Galaxy Tab S and Galaxy S5 are in the same local network. 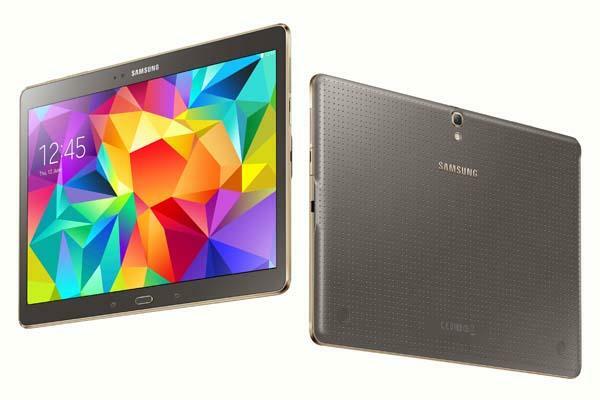 Samsung Galaxy Tab S 8.4-inch and 10.5-inch will be available from July this year. The WiFi versions of 8.4-inch and 10.5-inch are priced at $399 and $499 USD. If you’re interested, jump to Samsung official site (10.5-inch model) for detailed description.